we don't fall asleep at the table. I haven’t had much time to write this past month. Ideas come floating by here and there, but in the hubub of the holiday, they magically disappear and I honestly can’t remember what any of them are anymore. I always take that as a sign that I somehow wasn’t supposed to write them. One has indeed lingered as part of the #staywokeadvent synchroblog series. 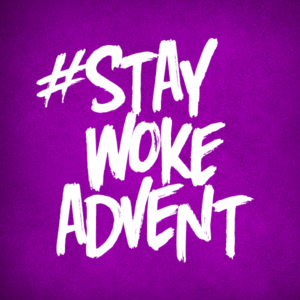 All month long people are writing reflections centered on this season related to justice and racism and advent and Jesus. As I mentioned a few weeks ago related to some thoughts on Ferguson, it is tricky to communicate online. There’s so much unsafety, harshness, and fear in many of the conversations, and I long for safe spaces to sit and process and share together face to face, eye to eye, heart to heart over long periods of time. Places to talk about the real stuff underneath the surface. To switch the conversation from the details of indictments into the more important issue that’s much harder to talk about–the deep grooves of racism in this country. We can’t talk about healing, justice, and change without breaking out of denial and facing this reality. And breaking out of denial is all about waking up. Here’s the thought that keeps swirling around in my head this advent season related to staying awake: We usually don’t fall asleep at the table. We fall asleep at home on our couches. We fall asleep in zoning out in front of the TV. We fall asleep sitting in church listening to someone talk. But when we’re sitting together with friends, eating and talking and sharing and being together, we usually don’t fall asleep. When we’re around the table, we look in each other’s eyes and know each other’s names and hear each other’s stories. We’re connected in a way that will never happen when we are sitting in rows facing forward or staying safe in our own little neighborhoods, safely segregated. We can tune out what we don’t want to hear. I keep being drawn to Jesus because I think he turns our let’s-keep-the-status-quo tendencies on its head. He turns the powers of this world upside down. He reminds us that following him will be hard and difficult and that there will be so many forces against it. He tells us that peace can be made and that deep humility is the path there. He wakes the world up. And the more I think about his teachings, the more I think that all roads lead to a very simple concept that we humans tend to really stink at–friendship. Not friendships with people like us. That’s not complicated, and the scriptures tell us that inviting our own little circle to our dinner parties is definitely not the idea. Jesus was always talking about friendship with people not like us. He calls us to healing and restoration and relationship that goes far beyond the surface and into our souls. Where the walls between us begin to crumble. Where we soften our hearts and let others in. Where we actually know each other. Where we give and receive, laugh and pray, listen and learn together. Where “us and them” begins to dissolve. Where we are no longer “over” or “under” another but instead are “alongside” as equals and real brothers and sisters. Where we are awake to God’s spirit at work. And every time I think about friendship, I always come back to the table. That mysterious place of hospitality and hope where we sit toward each other and tell our stories and share our hearts and learn things that we’d never know unless we were taking the time to be there. We don’t fall asleep at the table. I am all-in on activism, protests, and all of the things that are required to shift power and bring wholeness and healing to this land. Change won’t happen without it, and I hope more and more ground is gained this way. Justice is what love looks like in public (Cornel West) and it’s all so necessary and important. But I can’t help thinking that systemic change related to injustice & oppression, whatever that looks like, won’t really happen if we can’t sit at the same table together as friends. Friends who are waking up to each other, to God’s spirit at work, to our unique differences and our common ground, to the call to create a better future for our children together. Yeah, I’m not naive. I know it’s asking a lot. Relationships are hard to make. They call us to come out from behind our barriers & Bible studies & head knowledge & all-the-other-things-that-keep-us-protected. But the messy, crazy story of the birth of Jesus always reminds me how painful & uncomfortable & awkward & weird & unexpected God’s ways are. And in the words of Alexie Torres-Fleming is one of my favorite quotes: “The kingdom is not going to just drop out of the sky.” We have to participate in making it. This advent I’m personally humbled and reminded that it’s time to sit around more tables and pull in more chairs. To listen to more stories. To remember I’ve got a lot to learn. And the good news is we all always need to eat. 1. I’ve been thinking a lot about the movie “a time for burning” this past week. We watched it 6 years ago at a Refuge movie night & I wrote about it here. It’s the true story of a Lutheran pastor in 1967 who tried to organize a church social with an African American church. Oh goodness gracious, it’s a tough one to watch but with so many important things embedded into it to consider. 2. I am excited to be traveling in January & February for some Faith Shift Processing Parties–in Portland, Nashville, Seattle, and Phoenix. Here are some of the details and if you live near there and would like to join in, you are officially invited. 3. A few weeks ago I was on The Drew Marshall Show talking about Faith Shift. it’s always an adventure & here’s the link if you want to listen in. 4. Christine Sine’s got all kinds of good contemplative stuff up for Advent this month at her site at www.godspace-msa.com. She’s also coming to The Refuge May 30th 2015 for a Spirituality of Gardening Seminar. I’ll post details once we know them. Whew, that’s a lot of rambling but that’s all I’ve got for this week. See you Monday. ← when christmas is hard. Pingback: » we don’t fall asleep at the table. I heard that Drew Marshall show. “Rockstar” huh? Wow. finest city? I see you too have yet to write a review for Jeremy’s new publication. yeah, that bugged me but tried to roll with it 🙂 i am hoping to get down there in the spring and i think something is coming together so i’ll keep you posted. i haven’t read simple church yet but hope to soon. Hi Kathy! I enjoy your blog and sometimes participate in the synchroblog, as well. I’m going to be in Denver from December 30-January 2. So sad I won’t be there on a Sunday! Would love to visit The Refuge some day and meet you. Warm wishes from Mississippi! Kathy, love the thoughts on waking up at the table. Eating with others at my table has been helping me to live my way into a new way of seeing. It is a good way to cultivate friendships of equality, dignity and respect. And friendship is what we all need especially the marginalized, ignored and vulnerable. thanks, mark. yeah, it does open our eyes and equalize everything. no one is sitting over or under another at a table….peace to you this christmas week. see you in february! thanks so much for sharing, kelley. it is so clear it stirs up so many big feelings (re: the comments!) i really appreciate your thoughts and oh, how i hope change and healing can emerge in all kinds of ways over time. peace to you!